It’s one of the most frustrating things about Windows. You go to shut off your computer, and rather than just shut down, it decides it’s time to install a bunch of updates. So you wait and wait while this happens, all the while wondering why your computer is forcing you to stand there and watch it until it says you can go. There’s an easier way! Don’t get me wrong – Windows Updates are important. They are sent out on the second Tuesday of each month, which is called Patch Tuesday because most Windows Updates are little pieces of code that patch up security holes or software bugs that have been recently discovered. In a few rare cases, a Windows Update has been known to cause a problem, but that’s very uncommon. So you should get those updates when they come out, in order to keep your computer as safe and secure as possible. The downloading part of the process you probably don’t even notice, since it happens in the background even when you’re using the computer. Or it might happen overnight, when you’re not using the computer. So the updates are downloaded, and then they’re just sitting there waiting to be installed. At this point, if you don’t do anything with your computer, those updates will be installed automatically at 3 am the next day. BUT – if you happen to decide to shut down your computer or restart it before that, the updates will want to install right then. For me, this usually happens at a really inconvenient time. Like when a client is coming to pick up their computer and they’ve checked it all out and everything is repaired and working properly, so we go to shut it down and now we have to wait for the updates to install. 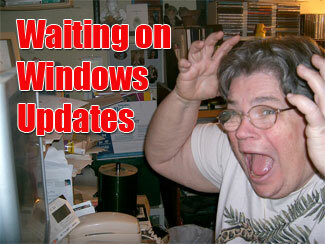 I actually try to get any Windows Updates while I’m working on it, but sometimes that happens. Or, if I hear thunder or see lightning, I immediately go around and unplug all the computers from the wall in order to avoid any voltage surge problems. At a time like that, I really don’t like waiting for the computer to finish getting all the updates while there’s an electrical storm happening. Fortunately, there is a way to turn off your computer and SKIP installing those updates. You’ll still need to get them, but you just don’t have to get them right that minute. 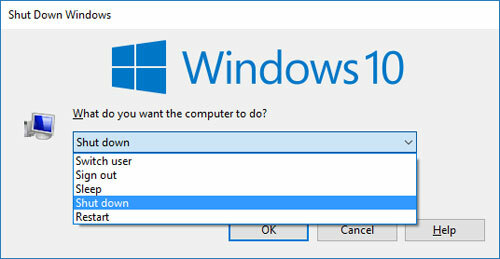 Here’s how you shut down your computer and skip the installation of Windows Updates. Close all open windows so you are just looking at the desktop with the icons. Hold down the ALT key and tap the F4 key. This brings up the Windows Shutdown dialogue. 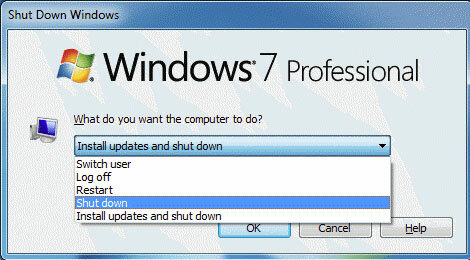 In the drop-down menu, just choose “Shut down”. If there are updates waiting, there will be other menu options such as “Update and shut down” or “Update and restart”, which of course you don’t want to use. What you DON’T want to do is to get in the habit of just using this shut down menu to continually put off getting those Windows Updates. This is just a way to get around it at the moment if you’re in a hurry and can’t wait for them to install.